Welcome to CANDLES web page. RCNP double beta decay project is challenging observation of 48Ca double beta decay with the CANDLES system, which is installed at the Kamioka observatory, Institute for Cosmic Ray Research(ICRR), the University of Tokyo. Our previous detector for 48Ca double beta decay measurement was the ELEGANT VI system. The detector gave the most stringent limit on half-life of 48Ca double beta decay by using CaF2 scintillators with total mass of 7 kg. 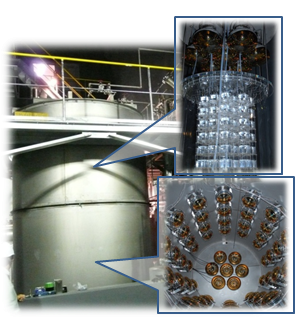 The CANDLES system is the scale-up detector of the ELEGANT VI system for the study of 48Ca double beta decay. Here we introduce the CANDLES detector and the related studies. Almost all substance of the universe is made of "matter". On the other hand, we know the existence of a partner called its "antimatter". At the beginning of the universe, the amount of "antimatter" is the same as that of the "matter". At present, no "antimatter" exists. Why does the universe mostly consist of "matter"? The one of the key points to solve the mystery is the lepton number violation that means "antimatter" and "matter" can convert to each other. The study of "neutrino-less double beta decay" will give a solution to the problem of "matter" and "antimatter". The purpose of the CANDLES project is to study of "neutrino-less double beta decay". "Neutrino-less double beta decay" has a very long half-life, which is longer than 1024 years. In order to measure the decay, detector system needs a large amount of double beta decay nuclei. In order to achieve this we proposed CANDLES by using CaF2 scintillators, which include the large amount of double beta decay nuclei 48Ca.